A total of over 2,100 Baptisms reported by adopted ministers from mid-May to mid- June 2015 from 7 local missions. There should be a lot more baptisms than these. At this time, one hundred ninety five (195) adopted ministers still do not have stipends for the month of June. The months (June to November) are the hardest for us. Of the 300+ adopted ministers, only around 100 of them have sponsors. Our funds for stipends each month is not enough and so we are always pleading with God for miracles. We have a dozen new theology graduates that have applied but we cannot place them because we lack funds. We thank our sponsors for your prayers and financial support. May God continue to bless you without limit. Please send donations to help God’s workers. From: Reva Moore (Founder of Adopt a Minister International). Please send help so we can continue working this volunteer ministry. 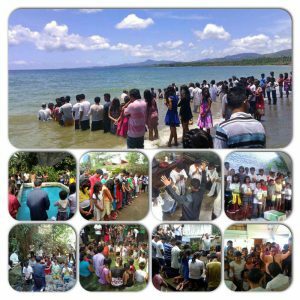 These are picture reports sent by 17 of our 300+ adopted ministers: Eugenio Gabat (CVC), Roger Estrera (DM), Julie Esteban (DM), Rodjen Anggolin (NCMC), Kevin Villanueva (SMM), Noel Bornales (CLC), Radney Gonzales (RAM), Robert Quibado (NCMC), Ray Tumampos (NCMC), Vlad Tugade (RAM), Delmer Barrientos (SMM), Jarez Zambrero (NEMM), Jay Linogao (SMM), Jay Policarpio (NCMC), Jay Saguinhon (NCMC), Juneryl Reble (CVC), Kerb Suan (DM).